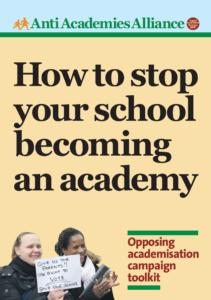 On Saturday the Haringey Campaign Against Academies organised an incredible demonstration against Gove’s plans to force some of the local primaries into academy status. There was an amazing atmosphere in the hall at Downhills Primary as parents, children and teachers gathered at the school in the morning for a pre-march placard making session, accompanied by big mugs of tea and pastries. 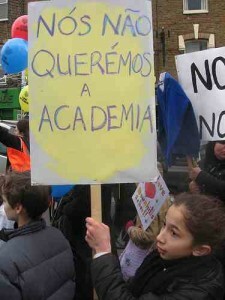 Tables of children drew placards with slogans such as “The mouse that roared” , “I love my school” and “Nós Não Querémos a Academia!”. 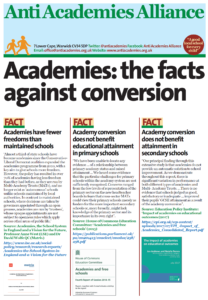 Nothing could have been a better advert for the strength of the school in drawing its diverse community together. 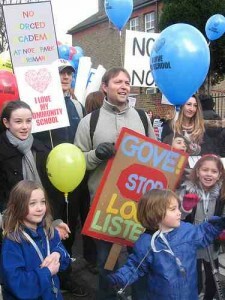 The love and loyalty that the children and parents clearly felt for their under-threat primaries was palpable. 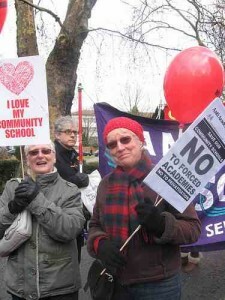 The march assembled in Keston Road next to the school before setting off to the civic centre in Wood Green. At first it seemed like there were probably around 500 people, but soon the numbers swelled further and as it set off it was a march of 1000 plus. Along the way cars beeped support and people stopped to clap and cheer the march. 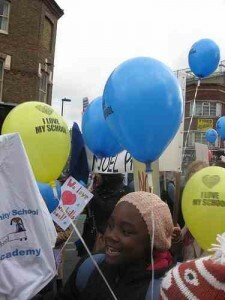 The children took over the microphone and led chants of “Save our Schools” and “Academy Calamity”. Some local people, when they realised what the march was about, stopped what they were doing, and joined in. “OURS” came the shout back from the assembled community. “OURS”. 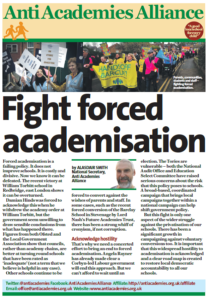 This entry was posted in News, Top story, Uncategorized and tagged Forced academisation, Protest. Bookmark the permalink. See “The Mouse that Roared” on Youtube for 3 videos of this great demonstration.